The Poster was the most important journal in English devoted to the art of the poster. 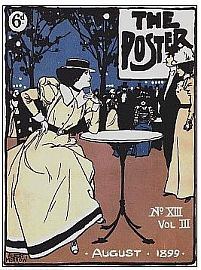 In addition to containing over 3,000 images (several in colour), it included interviews with and profiles of many of the leading names in poster design including Toulouse-Lautrec, Steinlen, Alphonse Mucha, Ethel Reed, Maxfield Parrish, Paul Berthon, Will Bradley, Arpad Basch, Jules Chéret, Jack B. Yeats, Aubrey Beardsley, the Beggarstaff Brothers, etc. The Poster also includes articles on poster art in Russia, Italy, France, Germany, Spain, Japan, Belgium, Austria, Hungary, Denmark, the Netherlands, Great Britain, the USA, etc., as well as articles on specific aspects of the poster, including bicycle posters, political posters, railroad posters, theatre posters, the poster as a mirror of life, plagiarism in poster design, symbolism in advertising, etc. In its final year (volume 6, 1901) the title was expanded to The Poster and Art Collector, and it began to include articles on related aspects of art including the design of magazine covers, book covers, bookbinding (e.g. a long article on the Guild of Women Binders), pictorial postcards, playbills, and theatrical caricatures. A complete file of The Poster is exceptionally rare, and because this journal has never been indexed, these articles are little known. In order to enhance the value of the digitization, we have classified the posters by subject and type. We have also added details of all the artists whose work is reproduced, giving their full name, dates, nationality, etc. In addition we have added over 1,200 links to web sites containing biographical information on the artists and examples of their work.